Ah, it’s pleasant to hear another installment of the Brad Lansky series. 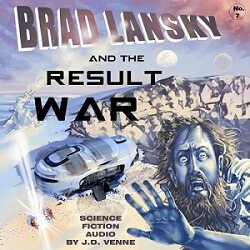 This is the seventh, and is preceded by Brad Lansky and the Rogue Era in which a rogue planet passes so close to the Earth that it knocks the Earth out of its familiar orbit. Long hard winters followed by short searing summers make living on the Earth difficult. The orbit is chaotic and GAIA, with its vast computational ability, is called upon to figure out the future of Earth’s orbit. How long with the Earth be habitable? As for Brad Lansky (the “tech-tainted human”), Alex John, and their AI-enabled ship (the Full Advantage) the story begins with them seeking Brinn, who is somewhere on the Earth. The story is hard science fiction, and the scientific ideas come at you in dense waves. The Brad Lansky audio dramas have a distinctive and enjoyable style that is continued in this installment. 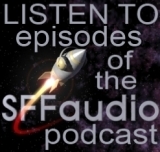 The most prominent feature is how much these audio dramas leave to the listener’s imagination. Often a scene trails off into a piece of music that creates space for emotion or action from a scene to fill one’s mind. I must emphasize the need to use some good headphones to get the most from any Protophonic production. And I also urge you to give yourself to it. Put the phone on “Do Not Disturb” and let yourself be taken away by it. Lately I’ve been craving good Hard Science Fiction tales. You know the kind… Stories in which the science plays a significant role in the plot. Stories in which the “science” in “science fiction” is more than just a setting. My craving was satisfied by this terrific audio anthology edited by Allan Kaster and read by Tom Dheere, Nancy Linari, and Henrietta Meire. These stories, taken from those published in 2016 in various venues, use your imagination to ask real questions about our universe. The narrators are quite good, confidently throwing science around like they know what these characters are talking about. I thoroughly enjoyed it and will be looking forward to next year’s anthology. This is my kind of science fiction. 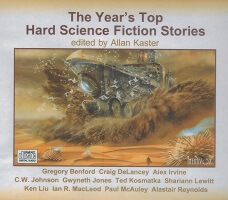 An unabridged audio collection spotlighting the “best of the best” hard science fiction stories published in 2016 by current and emerging masters of the genre, edited by Allan Kaster. In “Vortex,” by Gregory Benford, astronauts find a once thriving microbial lifeform that carpets the caves of Mars dying off. A code monkey tracks down the vain creator of a pernicious software virus that people jack cerebrally in “RedKing,” by Craig DeLancey. In “Number Nine Moon,” by Alex Irvine, illicit scavengers on Mars are on a rescue mission to save themselves after one of their team members dies. A young girl’s thirst for vengeance becomes a struggle for survival when she is swallowed by a gigantic sea creature on an alien planet in “Of the Beast in the Belly,” by C.W. Johnson. In “The Seventh Gamer,” by Gwyneth Jones, a writer immerses herself into a MMORPG community to search for characters being played by real aliens from other worlds. A woman armed with a rifle stalks a herd of cloned wooly mammoths in British Columbia in “Chasing Ivory,” by Ted Kosmatka. In “Fieldwork,” by Shariann Lewitt, a volcanologist struggles with her research on Europa where both her mother and grandmother suffered dire consequences. A daughter pays homage to her mother with mega-engineering projects to deal with climate change over eons in “Seven Birthdays,” by Ken Liu. In “The Visitor from Taured,” by Ian R. MacLeod, a cosmologist in the near future is obsessed with proving his theory of multiverses. The citizens of a small town on a “Jackaroo” planet object to a corporation placing a radio telescope near local alien artifacts in “Something Happened Here, But We’re Not Quite Sure What It Was,” by Paul McAuley. And finally, in “Sixteen Questions for Kamala Chatterjee,” by Alastair Reynolds, a graduate student defends her dissertation on a solar anomaly that threatens humanity. 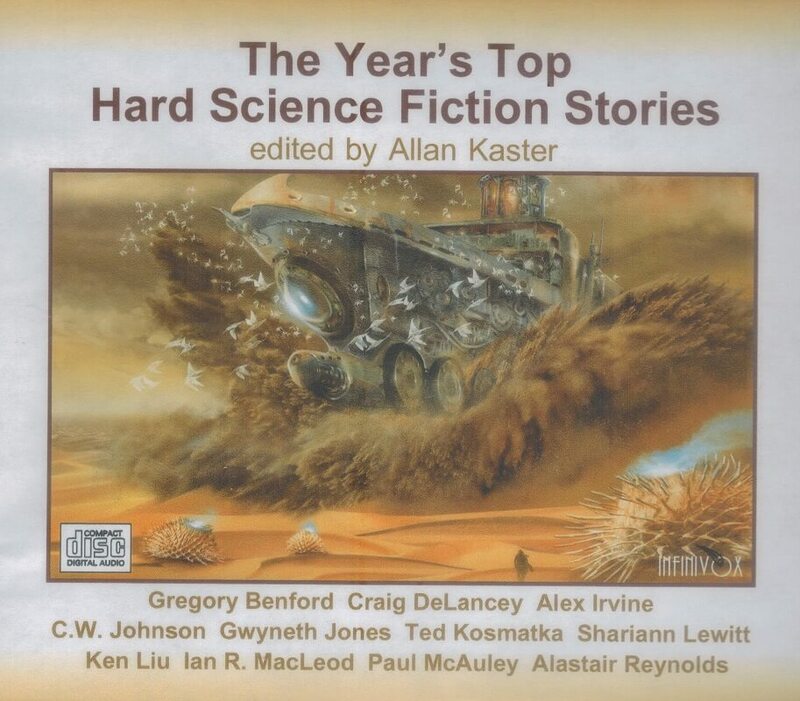 My favorite stories in the collection were Ken Liu’s “Seven Birthdays” and “The Visitor from Taured” by Ian R. MacLeod. I enjoyed all of the stories, though. Harry Dresden, Chicago’s only professional wizard, takes on a case as a favor to his friend Thomas – a vampire of dubious integrity – only to become the prime suspect in a series of ghastly murders. I can honestly say, Blood Rites is my favorite in the series so far. Now, this was also my first audiobook of the series so that could have something to do with it. It’s hard to tell at this point, but either way, I highly enjoyed Bood Rites. At first, I thought Marsters was a bit too serious for Harry, at least the Harry I had in my head, but the more I read, the more I realized Marsters is pretty much as perfect as you can get. Harry’s wit and constant one-liners were actually made more hilarious by this narrator who is serious for the majority of the time. I think the heightened seriousness really works better for these books because it gives you a sense of this highly dangerous world where Harry works on a daily basis. It’s hard to separate the story from Harry himself because it’s told in first person so you’re in Harry’s head the entire time (outside of dialogue from other characters). I thought this was a brilliant way to handle it though, where you get Harry’s sense of humor through his dialogue mostly, his thoughts as well of course, but a seriousness that anchors the narrative because Harry still lives in a world of scary monsters. I hope any of that made some remote bit of sense. Anyhow, Blood Rites gets back into the vampires (they seem to be a pretty regular fall back for Butcher) and that makes sense because the set up has been an all-out war between vampires and wizards. Someone’s taking out people on an adult film set and Harry has to go undercover to discover who’s behind it. Of course, it goes deeper than he imagined at first and there’s where the money is for this series… Harry getting into stuff only to get beaten down and beaten on … a lot. I struggled a slight bit with the first books in the series, but they have really hit their stride now. I didn’t even notice the typical repetitions this time (Harry disrupts electricity, Harry gets really protective of women, etc. etc.) that are explained in each volume as if no one’s ever heard about them before. It probably helps that it’s been a year or so since I last read in the series. Blood Rites was excellent. James Marsters is so perfectly Harry Dresden it’s almost scary. What a great combination. I’ve already broken my rule of leaving a year between each Dresden file read and started on Dead Beat. So, the only other experience I have with Blake Crouch is through the ridiculously insanely pulpy, Drakulas … written by three other authors. I can’t say I was able to tell who wrote what, so it really wasn’t a huge help. Other than that I had good feelings going in because Drakulas is amazing. Read it, do it. Dark Matter is difficult to explain without spoilers, but let’s just say it involves … science. Wow, could this review get more boring than that. Okay, there’s got to be a minor amount of spoilers to get this review moving, so let’s say spoiler warning for the first quarter of the book. Our protagonist, Jason Dessen, has the perfect life and, more importantly, the perfect family. Okay, his marriage isn’t perfect, but it’s a place he loves being in more than anything. In fact, it’s something he gave up a budding science career to pursue. Like anyone, he always imagines what it would be like if he’d made different choices. The only difference is that he actually gets to see for himself. While tightly plotted with one heck of a twist at the end (I thought), this book packs more of a punch in the psychological aspects. Considering the implications of the science (which I’m really trying not to spoil), the questions addressed by Dessen are what really got me. Thinking about what I would do in the same situation is what will keep this book in my brain for some time. What would you do for your family? What lengths would you go to to be with them? To save them? To permit them to be happy? What if that choice makes you miserable? Note on the narrator: Jon Lindstrom is one of those voices that really needs to fit the character if that makes any sense. I feel like there are some books that his voice wouldn’t work for. It worked for Jason Dessen. Craig Wasson (11/22/63 and many others) is one of those voices for me as well. I received an audio copy from the publisher for review. For centuries the vast Ironship Trading Syndicate relied on drake blood – and the extraordinary powers it confers to those known as the Blood-blessed – to fuel and protect its empire. But now a fearsome power has arisen – a drake so mighty that the world will tremble before it. Rogue Blood-blessed Claydon Torcreek, Syndicate agent Lizanne Lethridge, and ironship captain Corrick Hilemore embark upon perilous quests to chase down clues that offer faint hopes of salvation. As the world burns around them and the fires of revolution are ignited, these few are the last hope for the empire and for all of civilization. Another solid entry in this series. Here’s to hoping for a good ending with the final book. I hate narrator changes. I’m bad with names, so at first I almost didn’t notice the change from Stephen Brand to Steve West. Plus I like Stephen Brand, and he narrated the last four Anthony Ryan books. So Steve West had his work cut out for him because I came into this book heavily biased against him. I’m happy to report I thought he did a good job. I don’t know why they changed narrators, but Mr. West read with good volume and inflection and he added a few voices into the mix to make for a good audio experience. This series mixes such a wide variety of themes, it still seems strange that they all work together, but they do. First you have Lizanne, who I always just think of as Jane Bond in my head. Then there is Clay, who’s got a bit of an Indiana Jones vibe to his story. Finally there is sailor Captain Hilemore. Their narratives are all tied together with Dragon Blood. Added to the mix is Sirius. I don’t recall if he was introduced in the last book as a minor character, but he certainly wasn’t a POV in that. Much like Hilemore in the last book, his story felt mostly disconnected from the other three until near the very end. Unlike Hilemore however, I had a much better idea how his story was going to fit in with the rest well in advance. I found the start of the book a bit slow. It took me awhile to remember the characters and the details from last year’s The Waking Fire, and even afterwards I didn’t find myself completely sucked in. Once the book got going however I definitely enjoyed it. Clay’s story started the slowest of the four, although I didn’t find Sirius much better. Even Lizanne who’s definitely my favorite of the series felt like she was meandering a bit before her story got going again. The world building continues to be excellent. We learn a lot more about the Dragons and the blood blessed, and the nature of many of the mysteries from the first book. Clay’s story in particular reveals quite a bit of interesting details. I really like the world Mr. Ryan built here. Based on his previous series, I feel like Mr. Ryan’s good at writing both beginnings and middles, but struggles with endings. Queen of Fire felt rushed, and partially spoiled an otherwise perfect series for me. I hope he takes as much time as he needs (assuming his publisher will let him) to write the final book of this series. I think this book set things up nicely for that. Now I just have to wait and see how it all comes out. My mom bought me a virtually identical pair of these Bluetooth enabled sunglasses last year and I liked them so much I ordered a second pair (as backup) earlier this year. The eBay seller I bought them from sold them for $7.44 USD with free shipping to Canada. They took nearly 4 months to arrive – but they’re here and I’m all excited again! The original set cost maybe about $30, showed up in a different box, and came with a little black hard-shelled zipper case. Otherwise they look absolutely identical. I notice the female voice in the software, saying words like “connected” and “on” and “off” are different, and the name of the device when connecting via bluetooth is a different name, but they are otherwise identical. 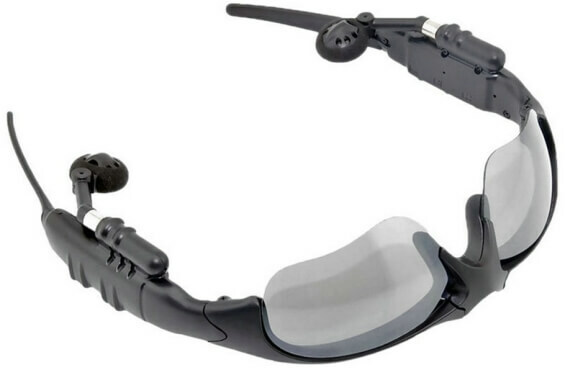 So why Bluetooth sunglasses? First because Bluetooth. I hate cables – they get tangled – they’re annoying. Second, SUNGLASSES! It is summer and the light is too bright and you need sunglasses. So that’s why. 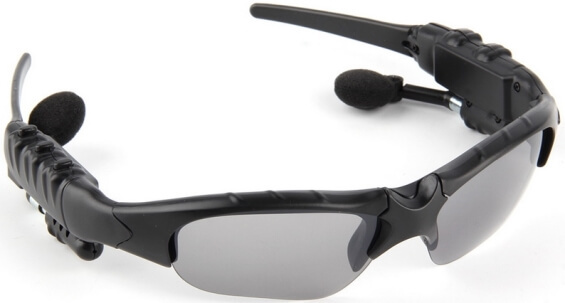 I love these Bluetooth sunglasses. The fact that the volume level is variable via multiple methods is so great. First, there are the up and down volume buttons (which I generally ignore, but are nice to have I guess), next you can up and down your glasses volume using your phone’s slider or volume up/down buttons (just like regular Bluetooth earphones) but best of all is the third way. A third way that is faster and more demonstrative than all of the preceding methods– the ability to physically pull and/or tilt the speakers towards or away from your ears. When some fellow human, you know the kind – the ones out in the world, deigns to say something to me unexpectedly, like “beautiful day” or something like it, I can bring up my hand, tilt an earbud away from one ear, and say: “Totally!” This gesture shows the human that I’m listening to them and also allows me to actually hear the creature without necessarily having to turn off or pause my audiobook. I can see you looking at my sunglasses. You’re looking at them and you’re judging them right now. You’re looking at them and you’re thinking – those– those are ugly. And I know you’re right, they are ugly. But what I say to that is “yeah, they’re ugly – they’re ugly like a Kübelwagen, ugly like a jerrycan, ugly like an Ikea Jerker desk.” The whole point of these generic unbranded sunglasses with built in Bluetooth headphones is they do two jobs and they do their two jobs both beautifully and on the cheap. 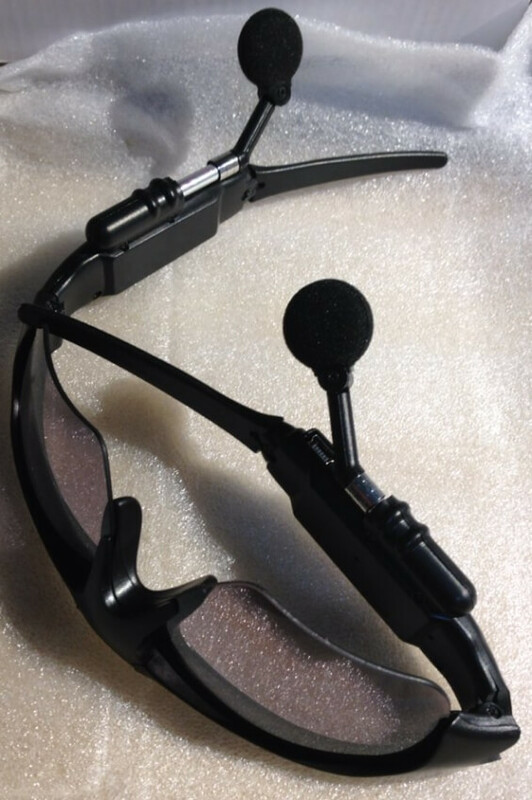 Whichever Shenzhen designer designed them wanted to incorporate two things that go on your head (sunglasses and headphones) and that designer did it. Funny story. 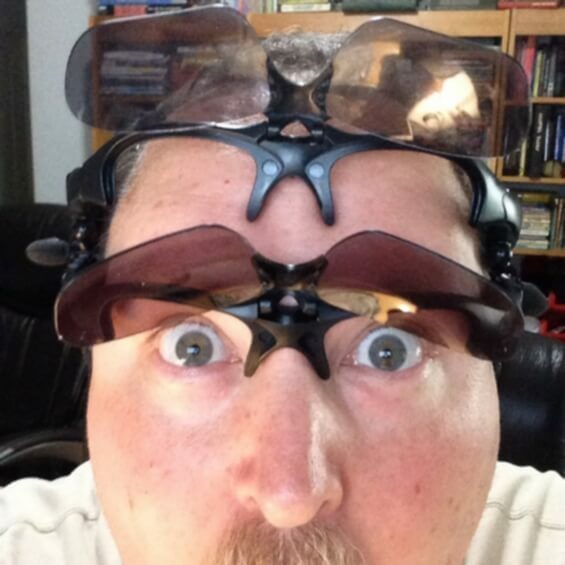 For months I walked around, wearing these glasses, and wondering at one particular aspect of the design. I asked myself, “why do they have all this thickness at the bridge of nose and almost no support for the lenses on the edges?” I speculated, idly, wondering if it was for durability. Then, one sunny day, ruminating at the fact that my sunglasses had to be worn atop my head when I went indoors (they are too fiddly and bulky to fit in the pocket of a pair of shorts and to bulky and heavy to hang from my shirt collar), I wished that these terrific cheap sunglasses I was wearing had a feature that would allow me to walk around indoors without the lenses over my eyes. You know what I mean right? I’m talking about those flip up sun-glass lenses that can just clip-on to regular glasses–anyway, I was thinking about this– and thinking about how it would be cool if those amazing iterating Shenzhen wizards could make a design that…. and then suddenly I realized that they already had! Yes friends, my sunglasses had flip-up and flip-down lenses and I had never known! Now, do I actually walk around looking like a doofus wearing my Bluetooth sunglasses flipped-up when I’m indoors? Yes, I’m afraid I actually do. They do look ridiculous. But they’re doing what I want them to do and that is far more important than me not looking ridiculous. In terms of other functionalities. I should just say everything works great. There are three buttons atop the right nacelle – the center one (the only one I ever use) is the on/off button – holding it for a few seconds turns the glasses on or off and either connects or disconnects them from whatever phone or tablet is nearby. They work terrifically, always pairing quickly, and get a better signal than my Bluetooth earphones. And the battery lasts all day (for me anyway). Now I should point out that the sunglasses say nothing about being waterproof. In fact I bet they are really not at all waterproof as the charging port is a non-waterproof micro-USB at the bottom of the right nacelle. But I’ve sweated in them, got rained on lightly and they’re still working and the a little LED still shows red when charging and still turns blue when fully charged.